Spray/grease a 9 x 13 pan or 8 individual ramekin dishes. Cut Challah bread into 1.5 inch slices and arrange in the pan filling gaps, so that you have a complete layer of bread. Melt the butter, brown sugar and maple syrup. Boil until bubbly, remove from heat and add the Rum Essence. Spread the mixture evenly over the top of the bread. To make the custard: In a large bowl add the eggs, salt, half and half, vanilla and Grand Marnier. Blend with a mixer or wand until smooth. Hand mixing works too but takes longer to get the mixture smooth. Slowly pour the mixture over the bread allowing it to soak in as you go. Refrigerate overnight. Mix the Cinnamon and Sugar together and sprinkle over the top creating crust. Bake at 350 degrees for about 35 minutes. It will puff and then sink a little as it cools. Serves 8 – 12. 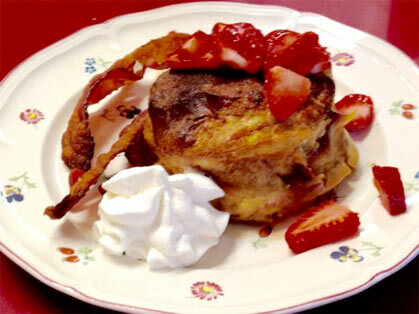 We add fresh sliced strawberries to this French toast and a dollop of whipped cream.